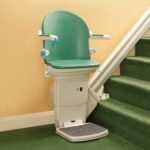 Stairlift Basics — Choosing a Platform, Straight or Curved Lift? 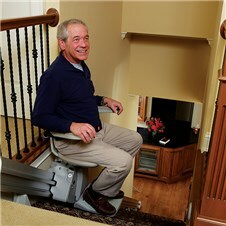 One of the most useful types of aging-in-place home modifications is the stair lift. While essential for an individual with a serious disability, they are more of a comfort to an elderly person (or someone with a mild disability) who welcomes the security and convenience of using a stairlift. 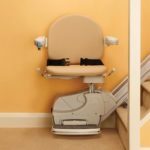 Here are a few stairlift basics for choosing a platform, straight or curved lift. Contemporary stair lifts are designed with useful options such as a soft start and stop feature, chair call stations, flexible seat height settings, a motorized ‘flip-up’ extension on the rail, and a motorized folding step. The typical stair lift is a chair version designed for a seated ride, but there is a ‘perch’ stair lift model available for individuals with knee injuries or for installations with an extremely narrow stair. 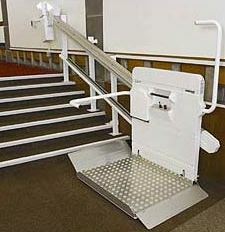 Platform stair lifts: The platform stairlift is most commonly used in commercial buildings, built of heavier materials to carry the whole wheelchair with the user seated in the chair. Depending on the installation, these lifts vary in degree of customization for each use. 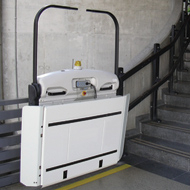 A variation of the platform lift is the inclined platform lift, which travels the path of an existing stair, and folds up in a manner similar to a standard stair lift enabling pedestrian traffic on the stair. Lifts which have been weatherproofed are also available for outdoor use. The following are more stairlift basics for choosing a platform, straight or curved lift. Stair lifts with a curved rail: A curved rail stair lift is required for curved or switch back plan stairs. 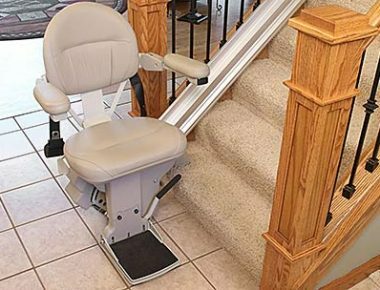 These stair lifts and rails require custom manufacturing and are therefore more expensive and have a longer ordering lead time. 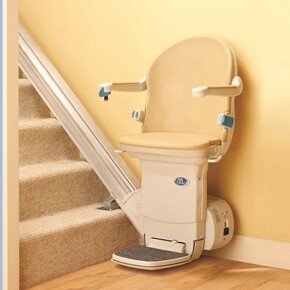 Stair lifts with a straight rail: The straight stair is most commonly found in residential and commercial dwellings. Therefore, a stairlift with a straight rail would be mounted quickly and economically in these dwellings to obtain two-story accessibility. 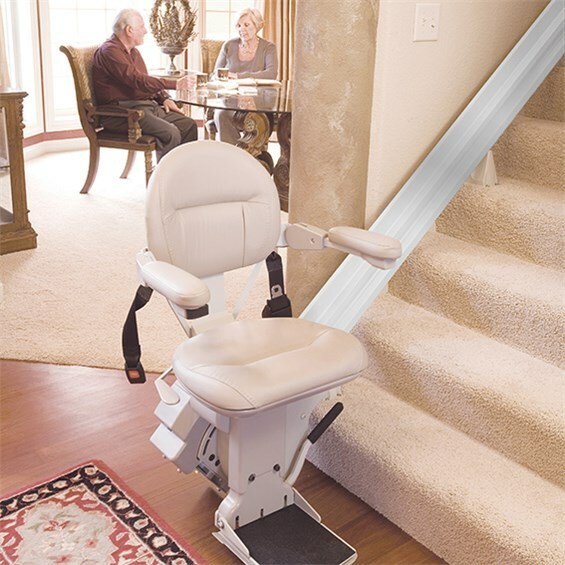 Another of the stairlift basics for choosing a platform, straight or curved lift, is that stair lift and elevator installation in the State of Georgia is required to be completed by state certified installers, under the inspection oversight of the State of Georgia. Atlanta Home Modifications, LLC reliably installs a Sterling stair lift in the metropolitan Atlanta, Georgia area for approximately $3000.00. You may contact Atlanta Home Modifications by calling 770.880.3405. 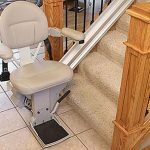 This entry was posted in Curved Stair Lifts, Platform Stairlifts, Straight Stair Lifts and tagged AtlantaHomeMods.com, Elevator, inclined platform lift, Stair Lift Installation Atlanta, Stairlift, Stairway, Wheelchair Lift. Bookmark the permalink. The Outdoor Stair Lift is Your Connection to the Backyard Barbecue!